This article is copyright Winston-Salem Journal and appeared in the 8/7/15 Bird’s-Eye View column by Phil Dickinson. It is reproduced here with permission of the Journal. On a sunny spring morning, an ethereal, flute-like song echoes from somewhere deep in the woods. I pause to listen. Sure enough, every few seconds an “ee-oh-lay” bursts forth. Every bird-lover I know revels in the tune of the Wood Thrush, even though the singer may remain hidden among the leaves. Wood Thrush ready for release. Photo by Phil Dickinson. How long will we hear this song? Due largely to loss of woodland habitat, numbers of this speckle-breasted cousin of the robin have declined by roughly 55 percent in the past 50 years. Future climate changes could imperil this species even further. Fragmentation of our forests has occurred both where the bird breeds in the eastern United States and where it winters in Central America. Conservation efforts on behalf of the Wood Thrush must take a hemispheric approach, including stops along its migratory flyway. The problem is that we know very little about the specifics of the thrush’s seasonal movements. Forsyth Audubon teamed up with National Audubon Society’s International Alliances Program and the Smithsonian Institution’s Migratory Bird Center to see if we could discover where some local birds traveled. The idea was to catch birds and attach GPS locator tags to them to monitor their movements. 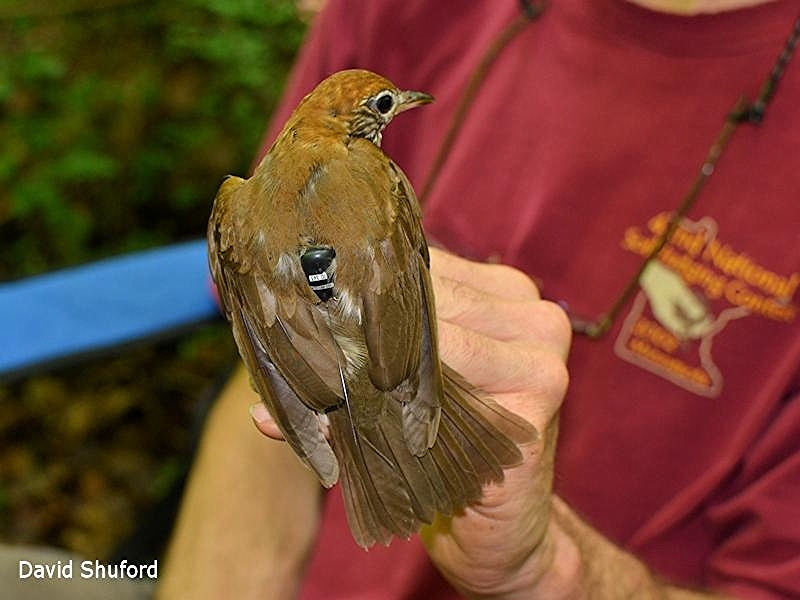 In Spring 2014, Audubon volunteers scouted local woodlands for Wood Thrushes. Bethabara and Pilot Mountain State Park’s Yadkin River section seemed to have the largest populations and became the focus of our tagging efforts. Peter Keller, a Smithsonian field biologist, arrived in May to begin trapping. Numerous volunteers were awake and out the door before dawn to assist in carrying equipment, setting up nets and recording data. 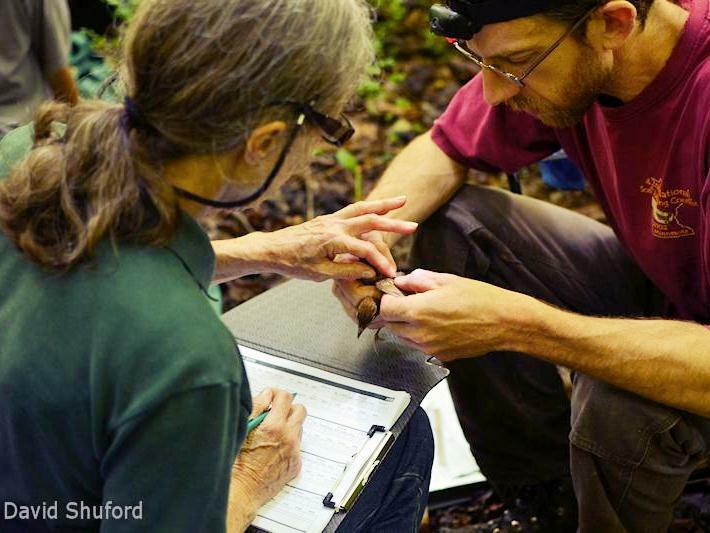 Peter Keller and Jean Chamberlain examine a Wood Thrush and record data. Photo by David Shuford. Females and young males were banded, but only adult males received backpacks carrying the GPS tags. They were big enough to carry them without hindrance and thought most likely to return to the same nesting areas. About 50 birds were banded. Of these, 22 received backpacks – 17 at Pilot Mountain and 5 at Bethabara. The tags would record movements during the next 12 months, logging 50 GPS points during migration and the winter season. The data would be precise – within a few meters. We would know exactly where the birds stopped. One problem – the tags record data but do not transmit. These birds are too small to carry signal transmitters used to track hawks. We would have to recapture tagged birds to retrieve the data! We needed them to return to the same area this past spring. Wood Thrush fitted with GPS backpack. Photo by David Shuford. This May, we returned to Pilot Mountain and Bethabara with another Smithsonian biologist, Tim Guida. How many GPS tags could we recover? Much can happen to a bird in a year and, even if it returns to the same location, we might not catch it. Smithsonian hoped for about 20 percent. Similar trapping efforts in Indiana, Minnesota and Delaware achieved recovery rates of 20-30 percent. However, we recovered only two GPS tags (9 percent) and netted only four other birds banded in 2014. A tagging effort in New York also had a low result (13 percent). Interestingly, we captured 44 unbanded birds. Habitat changes due to a prescribed burn at Pilot Mountain may have affected our recovery rate by causing tagged birds to move elsewhere. Bethabara’s relatively small size could have a similar impact. There probably is no single reason. Results from one tag thrilled local Audubon members. This Pilot Mountain thrush wintered in Belize, where five local members had traveled to work in partnership with Belize Audubon (Bird’s-Eye View, February 7, 2014). The other GPS tag was damaged, and attempts to recover that data continue. It could be valuable to know if that bird also has ties to Belize. Calandra Stanley works for the Smithsonian Migratory Bird Center. She reports that Indiana results showed a high degree of migratory connectivity. Birds captured there all wintered in southern Mexico. On the other hand, Minnesota and Delaware birds spread to different countries. 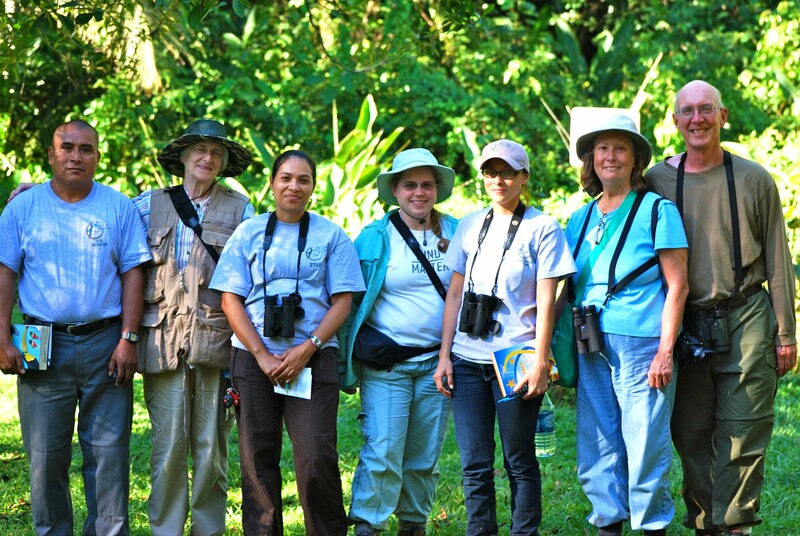 Nevertheless, the Belize connection provides inspiration for the two Audubon chapters to continue collaborating in some fashion to protect our birds. Over the next few months, the chapters and the International Alliances Program can figure out what form that cooperation might take. To hear the Wood Thrush’s song, see Wood Thrush at All About Birds. We were having a great time in Belize, but our trip was about more than having fun. It all started when we decided that we wanted to protect the wintering habitat for “our” Wood Thrushes. But, where do our birds winter? This spring, we will participate in a project that will tell us. We suspect that our birds go to Belize, so that’s where we headed. We wanted this to be a volunteer trip with real accomplishments, so Matt Jeffery of National Audubon’s International Alliances Program created a trip plan that would allow us to help our friends at Belize Audubon. The major item on our agenda was eBird training. Last fall I entered Cockscomb Basin Wildlife Sanctuary point count data for the last three years into eBird. Now the goal is for Belize Audubon to enter their own data going forward. eBird is new to all of the Belize Audubon staff, but our considerable experience using eBird made this a good task for us. Katherine Thorington prepared a PowerPoint presentation that would work with or without Internet access. 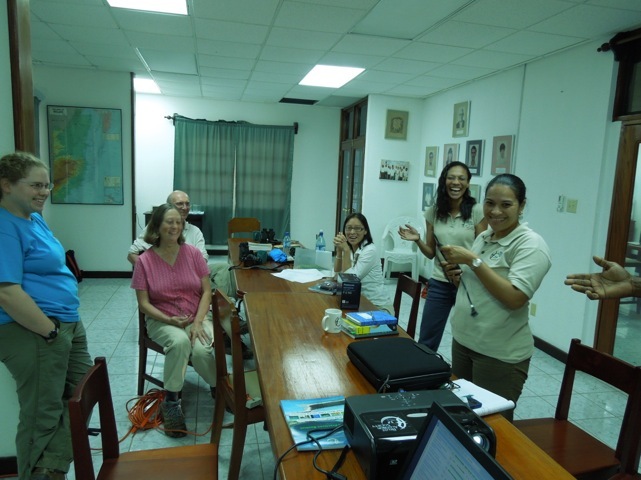 Katherine delivered the eBird training three times – at the Belize Audubon office in Belize City, at St. Herman’s Blue Hole National Park, and at Cockscomb Basin Wildlife Sanctuary. In Belize City and at Cockscomb we had an Internet connection, but it was intermittent (and mostly unavailable) at St. Herman’s Blue Hole. With Katherine’s warm and friendly style, the training was a big hit. In Belize City, we had wardens from Crooked Tree Wildlife Sanctuary and a high school student who joined the Crooked Tree Junior Birding Club several years ago. At all three sessions, our eBird students asked many excellent questions. They were excited about creating their own eBird accounts and getting starting entering data. Another task assigned to us was to help with a bird survey of Burdon Canal, near Belize City. It didn’t sound like work to us – a boat ride in wonderful weather looking at gorgeous birds! But, Matt insisted that it would be helpful. The canal and its lagoons are part of the Burdon Canal Nature Reserve. The canal was created in the 1920’s to help farmers get crops to market without enduring risks of the open sea. In 1992, Burdon Canal was designated as a nature reserve. The wetlands help prevent flooding in the city from rains and provide protection from storm surges. 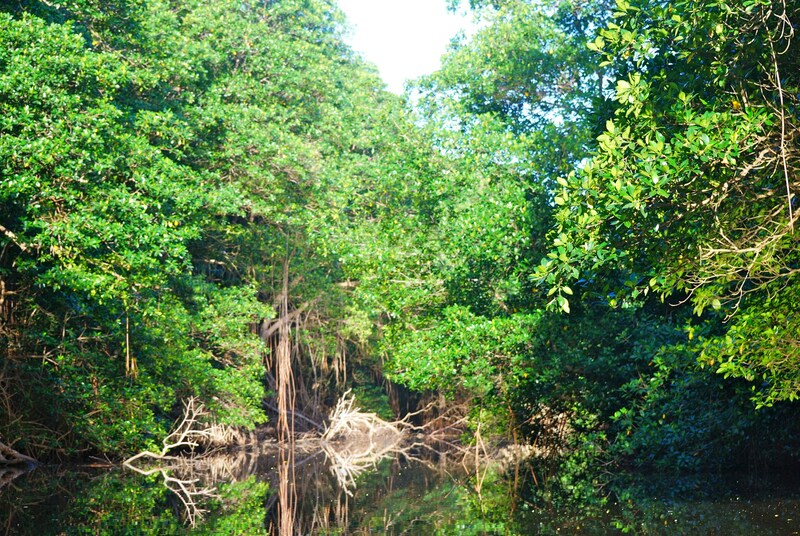 The beautiful red mangrove swamps and wildlife are also important for their proximity to Belize City which makes the nature reserve easily accessible. There are some bird records, but Belize Audubon wants to improve the list to better promote the site. 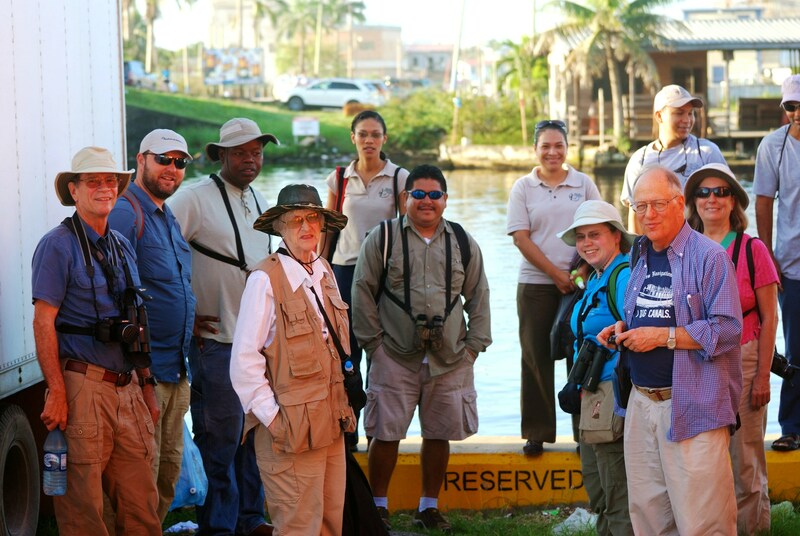 It was especially helpful that Birds of Belize author Lee Jones was able to join us for the trip. We entered all of our bird sightings into eBird. 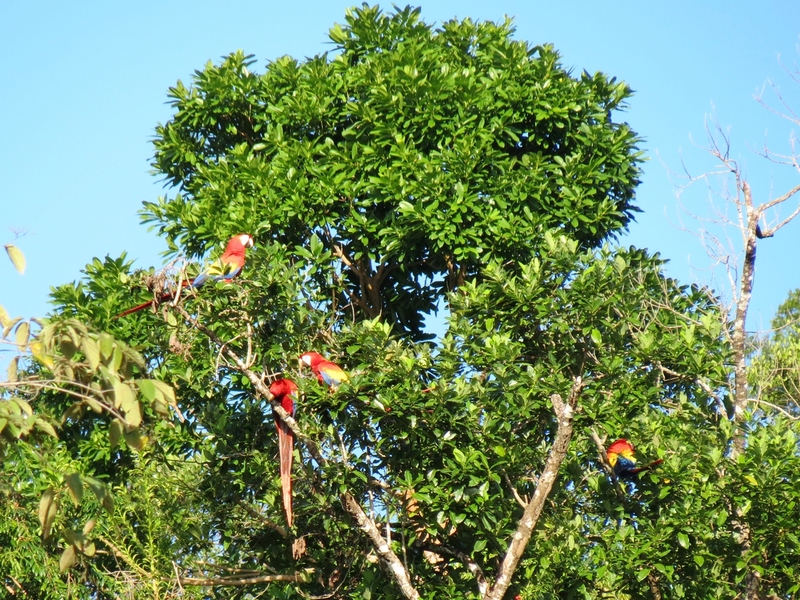 Scarlet Macaws are breathtakingly beautiful and highly sought after by birders and tourists alike. They are not common in Belize, but one area where they reliably are found is the small village of Red Bank, not far from Cockscomb, between January and March, when they come to feed on the sweet, ripe fruits of the ‘annato’ and ‘pole wood’ trees, which cover the hillsides. Only a few years ago, it was believed that the macaws were hunted for food, but now the ‘Scarlet Macaw Group’ has been formed and it is looking for ways to protect these gorgeous birds and benefit from their survival. 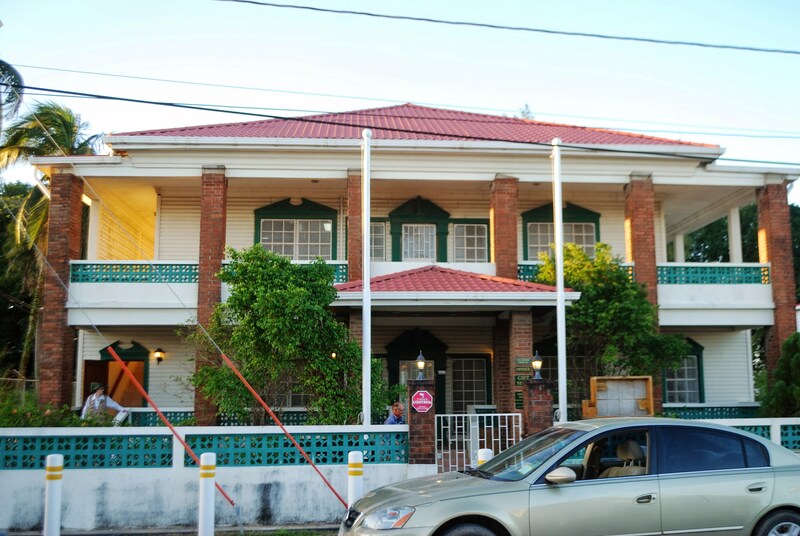 Belize Audubon is working with the villagers to help make Red Bank an ecotourism destination. We were fortunate and saw six macaws from the road, but the traditional route is to climb a steep mountain trail – a muddy trail without switchbacks, steps or toeholds of any kind. 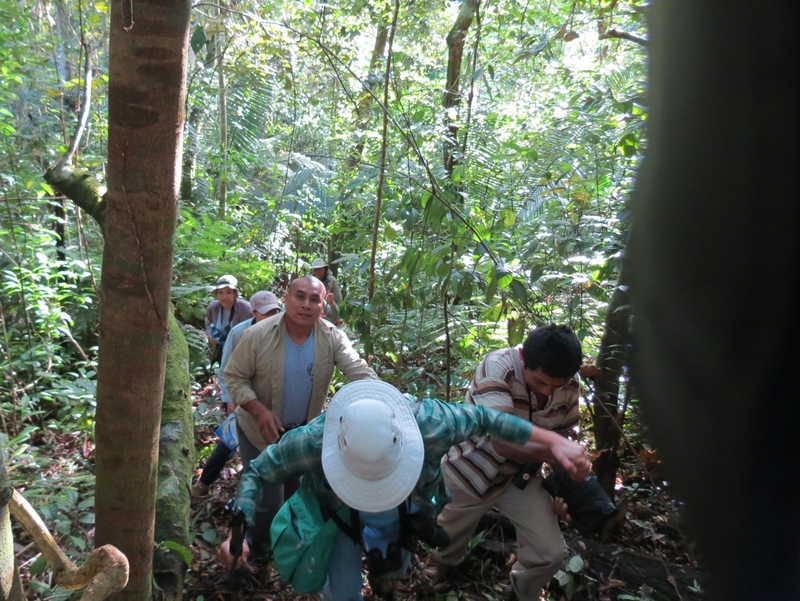 I was only able to “climb” the trail because our local guides held my hand and nearly pulled me up the mountainside. We did not need to offer advice on trail improvement; watching our ascent was enough for our friends to see that a better trail would bring more visitors. We offered advice on signage, though, and other tourist amenities. Red Bank has tremendous potential for becoming a great birding “hot spot.” We can’t wait to see it again in a few years. Our last “work” was to have a preview of the birding trail that Cockscomb is creating near their Visitor Center and to offer advice. They already have built trails and installed a bench and birdbath. We offered generous amounts of both compliments and advice. This will be another fun place to visit in a few years to see the improvements. We saw and heard Wood Thrushes nearly everywhere we traveled, typically four or five birds during each outing. We hope that some of them come to Forsyth County for the breeding season this spring. Sadly, it was time to say “goodbye” to our new friends at Belize Audubon all too soon. Meeting so many of these enthusiastic, talented, and dedicated people was the highlight of our trip. We hope that some of them can visit us here in North Carolina, too. This is the second in a series of five posts. 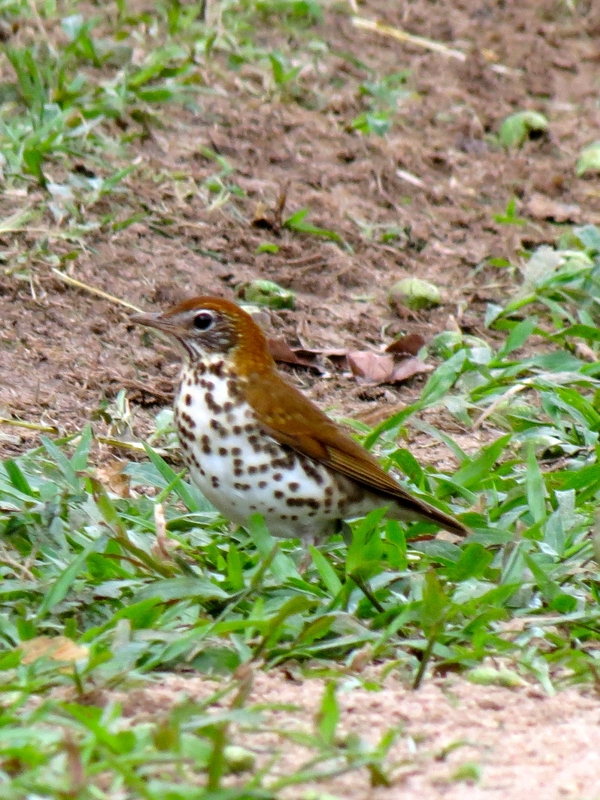 In last week’s post, I mentioned that I got to go to Panama because of the Wood Thrush. Here’s how. Since I joined the board of Forsyth Audubon four years ago, we’ve been looking for a way to make a big difference for birds. Could we buy and restore a marsh threatened by development? No, land here is too expensive. Could we help a declining species that breeds in our area? 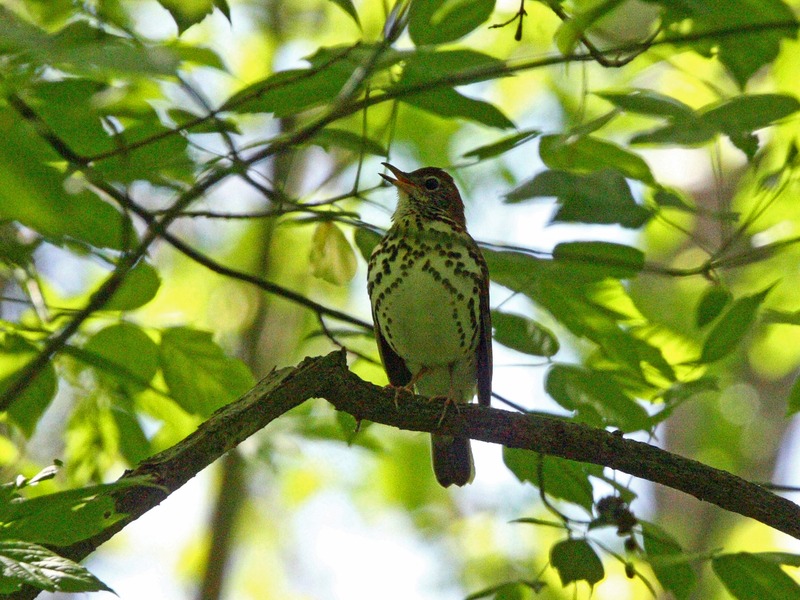 We considered the Wood Thrush, and Katherine Thorington and I led a pilot study on Wood Thrush nesting at Historic Bethabara Park, but it still wasn’t clear how we could help in a big way. 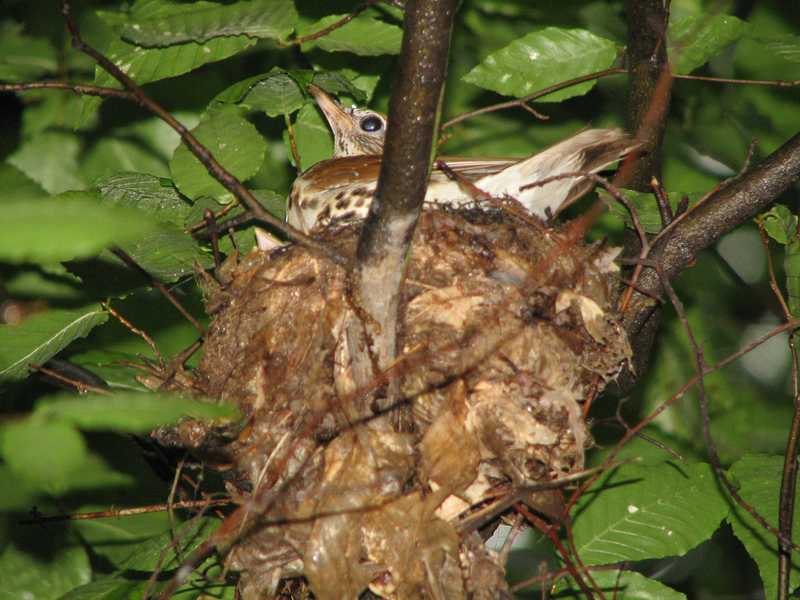 Wood Thrush on nest with chicks. Photo by Katherine Thorington. It didn’t occur to us that we could help the Wood Thrush anywhere but right here, where we live. But Audubon’s new strategic plan is all about whole life-cycle conservation and flyways. Knowing that, plus hearing about the Elisha Mitchell Audubon Society in Asheville giving all their Birdathon donations to the Cerulean Warbler Reserve in Colombia, got us thinking a little bigger. The idea came into focus at the Atlantic Flyway meeting in Baltimore, last March. Of the 100 or so Audubon people there, I was one of a handful of chapter members there to share chapters’ perspective. I met John Beavers, director of Audubon’s International Alliances Program. John is a good person to talk to if you want to think big. John showed me the hemispheric picture and helped me see our chapter’s connection to Central America – through the Wood Thrush. He said conservation groups in Latin America are a lot like chapters, with similar struggles and goals, and they need chapters as partners. Wood Thrush singing in Bethabara Park. Photo by David Disher. Back home, Forsyth Audubon board members were excited about helping the Wood Thrush at the flyway level. 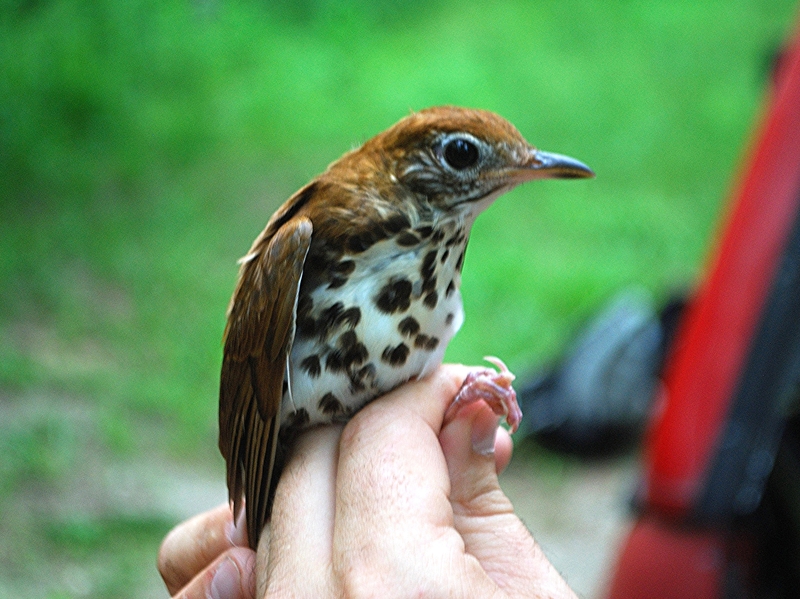 Everyone already knew the Wood Thrush is in steep decline. It’s OUR bird. We know and love its song, we know where it breeds, we know how to find its nests. Now we knew how we could help in a big way. We made the largest financial commitment of our 40-year history: $7,500 over 5 years. And we discovered a new sense of purpose. We will partner with Belize Audubon. Travel there to do field work. Our donations will pay for geolocators, training, whatever is needed to make conservation happen. At a hemispheric scale. The day before Thanksgiving last year, Heather Starck, executive director of Audubon North Carolina, called me to ask whether I’d like to share my chapter’s story, about helping the Wood Thrush through an international partnership, in a five-minute presentation to the National Audubon board… in Panama. In February. Why yes I would! The board meets three times a year. I was lucky to be invited to this meeting in particular, since it was the first time in nearly two decades that it was held outside the United States. It was exciting to meet David Yarnold and hear his vision for Audubon becoming a major movement with one million members. 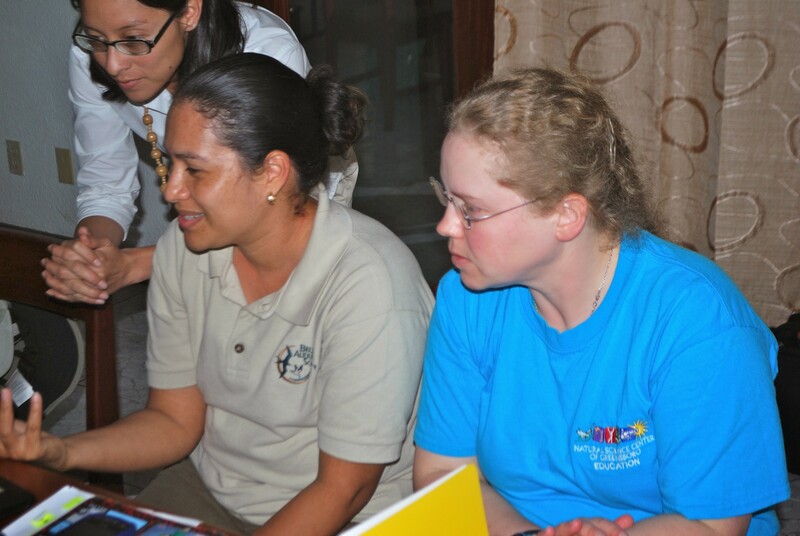 And learning more about international collaborations between Audubon and partners like BirdLife International and Panama Audubon Society strengthened my commitment to our own fledgling international partnership with Belize Audubon. After the three-day meeting and giving my presentation, I went on the optional field trip to the Chiriqui Highlands in western Panama. Fifteen of us were on the trip: some board members; Audubon staff members – including former executive director of Audubon North Carolina Chris Canfield and his wife Kate Finlayson; Panama Audubon Society executive director Rosabel Miro; and our guide, Guido Berguido (Advantage Tours Panama). No more meetings. This was all birding, all the time. You can read more about birding in Panama in my earlier post. According to the latest annual chapters report, 66 chapters now have some connection to an international site. Ours is the first to partner with the International Alliances Program, harnessing the power of the Audubon network in a new way, aligned with flyways and the strategic plan. We’ll have more exciting developments to report soon!